The statement of capital was introduced on 1 October 2009 as part of the changes implemented by the Companies Act 2006, and effectively replaced the previous regime whereby there was an upper limit to the number of shares (‘authorised share capital’) which could be issued. An update to the contents of the statement of capital and the forms in which it needs to be included is effective on 30 June 2016. We describe the changes being introduced, and how they affect UK companies, in this article. For new companies formed with the model articles from 1 October 2009 (and other companies that amend their articles of association accordingly), the number of shares in issue can be increased without having to re-negotiate an arbitrary ceiling. Instead, companies limited by shares must maintain and in certain circumstances submit to Companies House the statement of capital. The statement of capital provides a snapshot of a company’s share capital at a certain date, showing the different share classes that exist, the amounts invested and the rights attached to shares issued. It does not itself show who owns the shares, although sometimes a list of shareholders must be submitted to Companies House alongside the statement of capital. It’s a requirement for all companies limited by shares, but not those limited by guarantee, unlimited companies or LLPs. What’s required in the statement of capital from 30 June 2016? The aggregate nominal value of the company’s shares – calculated by multiplying the number of shares in issue by the nominal value of each share. If multiple share classes exist, this calculation should be undertaken for each class and then the figures added together. ABCD Limited has two classes of shares, Ordinary £1 and Preference £0.10 shares. There are 100 of the Ordinary shares in issue, so the aggregate nominal value of this class is 100 x £1 = £100. There are 10 of the Preference shares in issue, giving a total nominal value for the class of 10 x £0.10 = £1. The aggregate nominal value to be reported in the statement of capital is therefore £101. The total amount unpaid on the company’s shares – this is a new requirement from 30 June 2016. Shares might be issued to a shareholder without them paying for them at the time of issue, in which case they are unpaid shares. It’s also possible to have partly paid shares, whereby part but not all of the amount due is paid. In both cases, the company might choose to call unpaid amounts at a later date. The total amount unpaid is simply the sum of all unpaid amounts on all shares in issue. EFGH Limited has one class of Ordinary shares with a nominal value of £1. 100 shares have been issued unpaid. Ultimately, the shareholders have agreed to pay £3 per share: this comprises the £1 nominal amount and £2 share premium per share. The total amount unpaid to be reported includes both unpaid nominal amounts and unpaid share premium. So the total amount unpaid for EFGH will be 100 x £3 = £300. IJKL Limited has two classes of share, with 100 Ordinary £1 and 5 Preference £10.00 shares issued. The 100 Ordinary shares have been issued unpaid with the £1 nominal amount remaining unpaid. There is therefore a total of 100 x £1 = £100 unpaid on this share class. The Preference shares are currently partly paid, with £7 of the £10 still to pay. The amount unpaid on this share class is therefore 5 x £7 = £35. IJKL will have to report a total amount unpaid of £100 + £35 = £135. While IJKL has different amounts unpaid on different share classes, it would also be possible to have different amounts unpaid in a single share class – if shareholders owe different amounts, which might be the case if a number of share issues have taken place. The calculation, however, will work in much the same way. MNOP Limited has 3 classes of share and there have been a number of share issues within the different classes. However, all the shares are fully paid with no unpaid amounts remaining. MNOP can therefore include a total amount unpaid of £0 in its statement of capital. Most companies will be in the position of reporting a total amount unpaid of £0. The name of the share class – This is a basic reference to identify the share class, and is required even if there’s only one class in existence. Popular examples include Ordinary, Ordinary A, Preference etc., often giving a strong clue to the type of shares they are. Prescribed particulars of the rights attached to shares in the class – the prescribed particulars are the rights, obligations and other conditions that pertain to shares in this class. They include details such as voting rights, dividend rights and any right to redeem the shares. While these details might also be documented in the company’s articles of association, they must be documented here – it’s not acceptable simply to refer to another document, like the articles. The currency in which the shares are denominated – while most share classes are denominated in Great British Pounds (‘GBP’), Euro, Yen and US Dollar shares are fairly common. There’s a whole range of other currencies recognised by Companies House which may, for example, be appropriate for a class of shares if the bulk of the company’s trading activities will take place in the respective country where that currency is used. The aggregate nominal value of shares of that class – calculated by multiplying the number of shares in issue for the class by the nominal value of each share. The new statement of capital effective from 30 June 2016 removes the need to show the amount paid up and unpaid on each share, instead introducing the simpler requirement to state the aggregate amount unpaid on the company’s shares. Previously, shares had to be separated out in the statement of capital by combinations of amounts paid and unpaid per share, which was often a real chore for companies with a complex history of share issues or reorganisations. The change to the contents of the statement of capital coincides with the introduction of the confirmation statement, but going forward the statement of capital only needs to be included within this annual form if it differs to the last submitted version. If there’s been no changes to the statement of capital, it doesn’t have to be repeated in each confirmation statement. While the annual return is being phased out from 30 June 2016, any AR01 form that is physically submitted on or after 30 June 2016 – those that relate to an annual return period before 30 June – must also feature the new style statement of capital. The change to the structure of the statement of capital doesn’t remove the need for a company to maintain accurate records of the unpaid amounts due on different shares, and a comprehensive shareholder management tool like Inform Direct is invaluable here. If the company later wants to call an unpaid amount, it will need to have accurate and up to date information on which shares it applies to, the amount that’s unpaid and which shareholders hold the shares where the call is due. When is the statement of capital needed? Although the Companies Act defines it as a separate statement, often the statement of capital is included within a number of other Companies House forms. That’s true whether the form is submitted on paper or electronically: either way, a service like Inform Direct will automatically assemble a compliant statement of capital that can be submitted. Firstly, a statement of capital is required by companies limited by shares when first forming the company via form IN01. 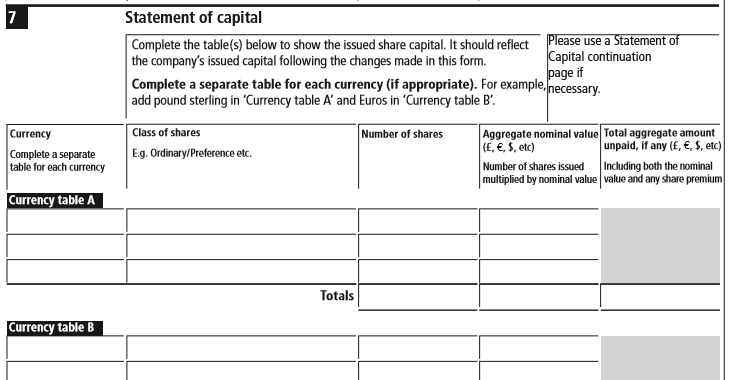 Every annual return submitted for a company limited by shares on form AR01 must include the statement of capital. That includes annual returns issued from 30 June 2016 that are made up to an earlier date. From 30 June 2016, companies filing a confirmation statement on form CS01 can also include a statement of capital as part of the form. 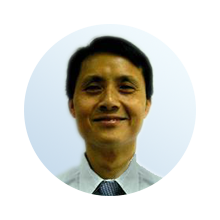 However, it only needs to be included where the share capital position has changed since the last statement of capital submitted. That might, for example, occur when in the course of a confirmation period a company has made a call on shares that were previously unpaid or partly paid. If a shareholder asks for this information, a company should also be prepared to send them a copy of the most up to date current statement of capital. Inform Direct is the innovative and easy way to manage a company's shares, make new share allotments, record share transfers, process share reorganisations and more.